It was nice to have a few weeks at home and to get back training with the England squad before we headed off to India. Our last outing as a team was the ICC Women's World T20 final in the West Indies, which has now had a few months to sink in. We actually sat down as a squad to watch the final back last week. It brought back all the emotions that you felt throughout the day: the excitement, the nerves and ultimately the heartbreak of the result. I'll be honest, it wasn't an easy watch. But with a massive 12 months of cricket ahead of us, including West Indies at home, an Ashes series and another T20 World Cup which starts in February 2020, we can learn a lot from that game and it's certainly a motivator to keep moving forward and to keep developing as both individuals and as a side. We arrived in India on 13 February and it's great to be here. It's always a tough place to go and win, especially with India playing the way they have recently. We've picked a strong squad and it's brilliant to have Katherine Brunt and Sarah Taylor back and available for the trip - plus it's great to have Freya Davies as part of the touring group for the first time. No England women's side has ever won a bilateral one-day international series in India so that's our first aim. We'd like to make that bit of history and get 2019 off to a good start. It was great to be involved in the Women's Big Bash League again and back with the Hobart Hurricanes after missing last year's tournament through injury, but it was a frustrating season for us as a side. There were a number of close games in which we just couldn't get over the line - including two super overs! I had an OK season with bat and ball but I was really disappointed not to win more games for the team. Having captained pretty much every team I've played in for the last three years, it was nice - if a little strange at first - to slip back into the ranks and not be captain. It gave me a bit more headspace and allowed me to really concentrate on my own game. It also meant I was back out on the boundary, although the novelty wore off a bit after a few games of running from long-on to long-on every over! The standard felt like another step up again this year as the game keeps developing and moving forward. I'd say from my experience, the quality of cricket in the WBBL and the Kia Super League in England are very similar, the crowds are similar (if not more consistent for the KSL), but the main difference seems to be that the WBBL has more non-international players being given opportunities and consistently putting in performances. An inevitable consequence of the clubs in Oz being professional for a few years now. 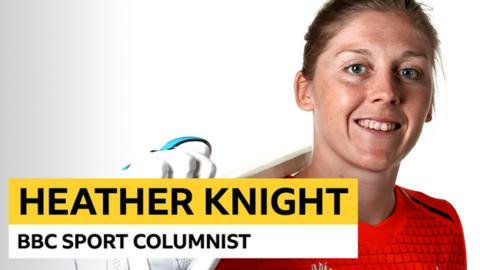 I'd love to see some more non-international English players in the KSL make a name for themselves this summer and hopefully down the line this will become easier with players being able to train more full-time with the changes planned to the English women's domestic game from 2020. The next WBBL season is moving earlier in the year to become a stand-alone competition separate from the men's. I think it's a brilliant move following the success of the first stand-alone World T20 in the West Indies and the excellent crowds the competition drew. I've never been a huge fan of double-headers with the men's teams - although there obviously can be benefits - and I'm sure following the success of the competition this year it will be well received. The schedule was quite busy this year, but off the pitch I managed to show some of the Hobart newbies - mainly Beth Langston (who was out there playing club cricket) and Alex Hartley - some of the sights. My mum and partner were also over and I threw everyone in the deep end a bit with a half-day trek to a beautiful spot in the Tasmania bush called Shipstern Bluff. Unfortunately a little wriggly friend decided to join us too and having never seen a snake before, I completely froze. A reaction slightly different to Alex Hartley behind me, who promptly grabbed me and used me as a human shield. Got to look after yourself, hey Al! Also during the WBBL, Kiwi international Sophie Devine came up with the brilliant idea of challenging people to wear a headband while playing in aid of charity. I gladly took up the mantle to look like a plonker alongside Hartley in our game against the Adelaide Strikers. Take a look at the picture below - who wore it better? The Headband Challenge really took off and lots of money was raised for various charities, so well done Sophie! Knight (back row, third from right) and the Hurricanes players supported New Zealand star Sophie Devine's "headband challenge"
Since the World T20 it was announced that long-serving England off-spinner Dani Hazell has decided to announce her retirement. She was my first ever room-mate on tour back in 2010 and we've gone through a lot of highs and lows over the last nine years. I'll really miss having her in the dressing room. Dani's one of the fiercest competitors I've ever played the game with, and the way she helped and guided some of the younger spinners coming into the team was invaluable. She's had a brilliant career, including a spell as the top-ranked T20 bowler in the world, and hopefully she'll stay involved with the game in some capacity.